Facebook Marketing for Beginners and Why Businesses need Facebook Marketing? In our “School of Marketing” which is our educational blog we will cover a series of both marketing as well as digital marketing techniques, strategies and tools which can be used by small, medium and big businesses as part of their marketing strategies. For a couple of weeks starting this week we will cover about “Facebook Marketing”. The different objectives, strategies, targeting parameters and case studies of how Facebook as a platform can assist your marketing efforts. One of the tools that can be easily used to market your business online is: Facebook. Every morning as soon as we wake up we check our phones and one of the apps that all of us have on our mobile is “Facebook”. Most of us use it to stay connected with our friends and family; some of us use it for networking making new friends and sending a friend request to a business owner we know of or heard of. Have you ever considered marketing your business on Facebook instead? Around the world, Facebook has 1.29 billion people 62% of whom log in on a daily basis. Let’s do the maths it’s huge. Globally, the average user spends 50 minutes per day with Facebook. As a business can we really ignore this audience? Audience with age groups of 18 – 29 are very active on social networking platforms. It is least popular with those 65 and older. So if your target audience is 65+ years older then, you can definitely ignore social networking platforms like Facebook. Any business, big or small before it starts a marketing activity should define the business objectives for this activity. 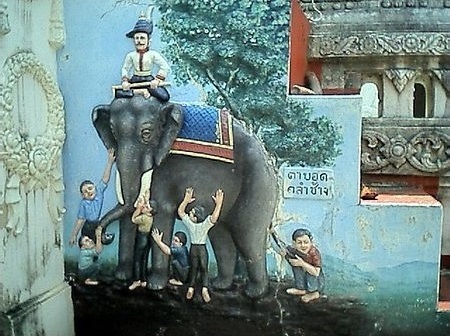 each of them sought a different body of the elephant and they could never get the whole picture. Similarly, your business will never be able to achieve its goals nor be able to measure the campaign results. Brand Awareness is to make sure that people know what your business does and ensure that whenever they have a need for your product/service they will remember YOU. Simply, if they don’t know what you do then you will never get their SALE. So it is about creating “Visibility” and “Brand Recall”. How Facebook can help you achieve Brand Awareness? 1. Reach: Facebook as a platform provides your brand an opportunity to reach out to people who matter to your business and for them to discover your brand. 2. Deliverability: Facebook ensures that your brand message is delivered to the right people that matter to your business. 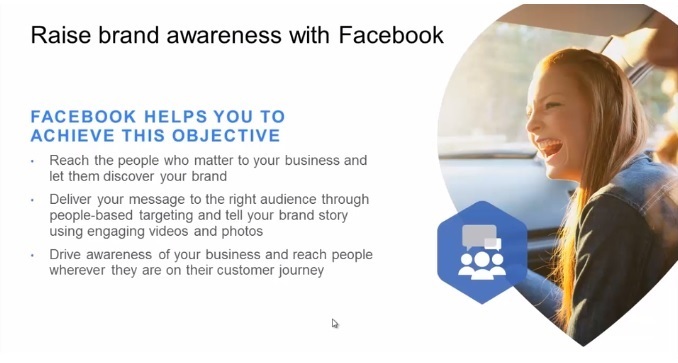 Let us look at a case study regarding how brand awareness objective can be fulfilled by Facebook for a business. “Ramya Bakes” (a fictional bakery company) is a bakery owned and managed by Ramya, she is looking to increase her brand awareness and visibility so more people can come to her bakery and become her customers. How can Ramya Bakes increase brand awareness? 1. Running ads in Newspapers/Magazines. 2. Their friends or family references. 1. Posting news on online platforms like Facebook which can then reach your customers. 2. Customer reviews of your brand online which will give credibility and reach your customers friends too. Online Word of Mouth has a “Compound Interest” kind of effect where in you don’t just reach your customers but you reach their friends and friends of their friends too. This makes your brand reach to potential audience whom you can never meet personally in a lifetime were you marketing your brand in the actual world. Lead Generation ensures that your product/service creates brand recall to people who are interested in it resulting in sales enquiries. Facebook also makes it easier for people to request your information related to your product/service and also provide their details thus filtering people who are serious about buying your product/service vs others. 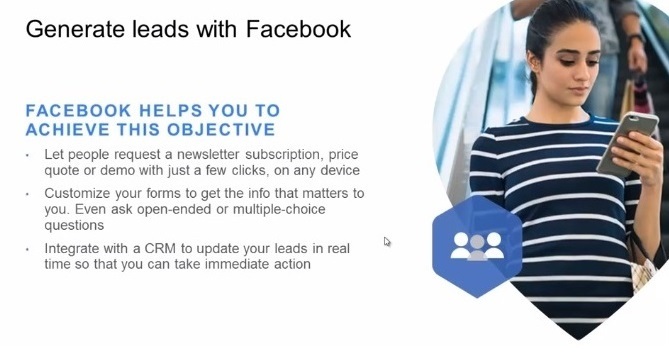 How Facebook can help you achieve Lead Generation? 1. 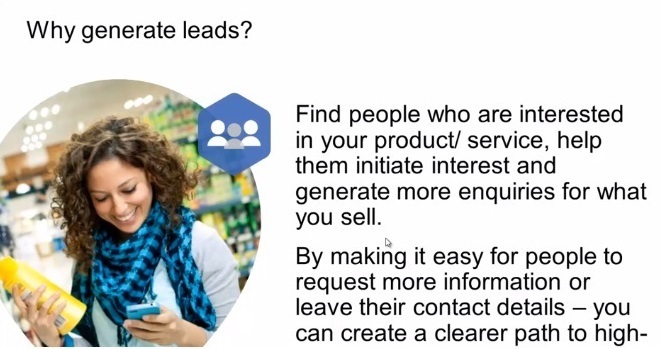 Potential customers can reach out to you for your prices, product quotes, product demos etc. 2. You can customize the lead form to gather the information that makes more sense to you. For example: If you are a real estate company you can ask people to fill out their budget to buy a flat or a villa. 3. The lead generation form can be directly integrated to your company’s CRM so all the potential leads are available at one place for your sales teams to pursue. “Srishti Constructions” is a real estate company which is into building apartments for middle class segment and villas for high class segment. Business Objective for Srishti Constructions is to generate leads from interested parties who are actively searching to buy a flat or a villa. Their aim is to gather the budget figures from people looking to buy a villa so they can screen the relevant “HOT” referrals from the “Colder” ones. How can Srishti Constructions increase lead generation? 1. Running ads in Newspapers/Magazines/Pamphlet insertions. 3. Posting news on online platforms like Facebook and incorporating lead generation forms. 4. Advertise to people of certain titles like “CXOs”, “NRIs” who might be actively searching to buy property in India for themselves, their parents or family or just as an investment. 5. Integrate the details gathered from the lead generation campaign directly into their CRM or send it to their sales team so the sales team can call the customer directly to provide more information. We hope you enjoyed this week’s School of Marketing dose for Facebook Marketing. We will continue discussing about the other objectives for face book marketing, so stay tuned for next week.